EasySMF allows you to view information from z/OS SMF data on your PC. It is a standalone program – no additional software is required to process the SMF data. Switch between different reports for the same time range, to easily relate information from different SMF records. Zoom into and drill through reports to see more information. Built in FTP client to load SMF data directly from SMF dump datasets. 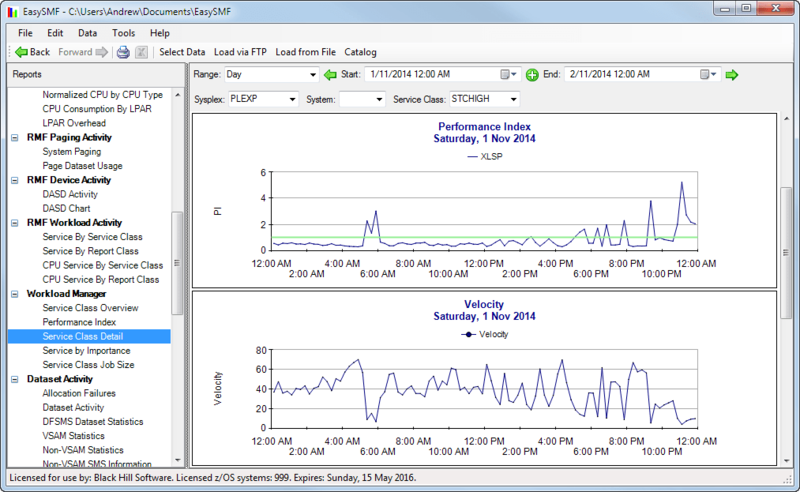 Alternatively, load SMF data from PC files, zip files or TSO TRANSMIT format files. Send data from tabular reports directly to Excel 2007 or later. Job Completions – information about ended jobs and tasks. Job Status During Interval – combines information from all type 30 subtypes to show jobs that started, ended, were running or complete during the selected time interval. Workload Manager Service Class Information – Performance index, velocity, service consumed, response time and delay information for a service class. Dataset Activity – reports various SMF record types that show different types of dataset access. RMF service by service class and report class. All sections of type 30 and type 70 records. Download EasySMF now and try it free for 30 days. CPU and memory: Requirements vary greatly depending on the amount of data to be processed. The base requirements for Windows are sufficient for smaller systems. More memory is required for larger reports. Typical Windows PCs are large enough for most systems. Disk space: Space to store compressed SMF data for reporting. Typical compression is about 90% so 100GB of disk space will hold about 1TB of SMF data. Individual record types can be selectively deleted if necessary to save space.